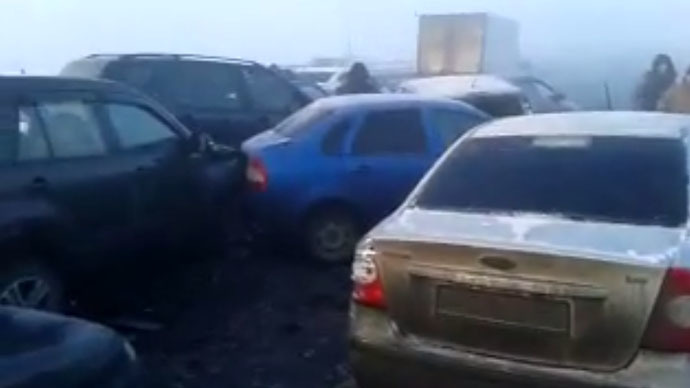 A misty, gloomy morning and icy roads have led to a freak road accident in the town of Zhukovsky, near Moscow, where some 100 cars have crashed in a massive pileup. Only two injuries have been reported as of yet, however, while local media says a couple of drivers are also stranded in their cars, unable to get out. Rescuers are having a hard time reaching the affected cars, because of a huge traffic jam at the scene. Some dashcam videos are showing a smashed-up mess of vehicles. Witnesses at the scene claim the insane string of collisions started with two heavy trucks ramming into each other. One thing led to another, and close to 100 cars appear to have suffered in the ensuing mass crash. Drivers are reporting visibility at close to zero, due to the heavy mist. This meant they had virtually no way of seeing the tons of metal already slammed into each other up ahead, until they were only meters away. No one thought about slowing down until it was too late – and cars were traveling at average speeds of up to 100 kilometers (60 miles) an hour. “We’re lucky it’s a new road with a divider – otherwise you’d have cars slamming into each other head-on,” an eyewitness told Gazeta.ru. It’s starting to come out, however, that not all precautions were taken to avoid the accident. The police “took more than an hour to seal the road,” another eyewitness said. He blames the traffic police for at least part of the situation. This is not the first time an accident of this sort has occurred on this stretch of the road, it turns out. Drivers are blaming bad conditions and ice on the road. Moscow saw something similar take place downtown in October 2013, when around 50 cars were in a pileup. As with the Zhukovsky accident, there were allegations that the surface of the road might have been doused with a cleaning chemical that makes no sense in conditions below 5 degrees Celsius.